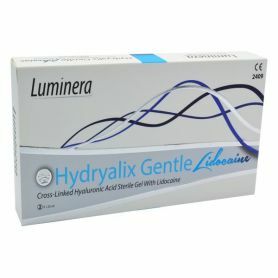 Hydryalix is a homogenic gel, biodegradable and long lasting. Hydryalix contains HA 20 mg/mL from non-animal origin and is cross linked using BDDE. Indicated for superficial lines, fine to moderate wrinkles and minor skin damages. The product can be used on wrinkles, lines and creases around the mouth, excellent as a skin booster. HYDRYALIX provides the benefits of both monophasic and biphasic fillers. 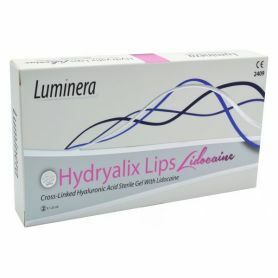 Hydryalix is a CE mark, sterile, transparent cross-linked Hyaluronic Acid (HA) injectable filler. The gel is monophasic thus, smooth, homogenous and easy to extrude. Produced in a manufacturing facility operating under strict ISO9001 & ISO13485 conditions. The longevity of the HA molecules injected is increased by the cross linking process using BDDE that creates a new 3D network. The HA concentration is 20 mg/mL. Hydryalix contains HA from non-animal origin and is cross linked using BDDE. Residual BDDE in the final product is less than 2ppm. With added Lidocaine for increased comfort during treatment. Injection depth: superficial and mid dermis. An injectable, sterile, apyrogenic gel intended for soft issue augmentation. Composed of cross-linked hyaluronic acid from non-animal source. The gel is latex-free, viscoelastic, clear, transparent and bio-degradable. Sodium hyaluronate (20 mg/ml), cross-linked <2ppm). 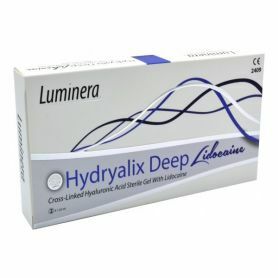 Luminera's state of the art technology for the production of Hydryalix, our cross linked HA line of products, gives the advantages of both monophasic cross linking and biphasic gel properties. Monophasic gel, which is homogenously cross linked, generates a smooth, uniform gel, lowers side effects, such as swelling and the Tyndall effect, and uses less BDDE for the cross linking process. Monophasic gel is 100% cross linked. Biphasic gel has two phases, a highly cross linked phase of HA particles and a non-cross linked HA phase in which the particles are suspended. This non cross linked phase is needed to enable the injection. In our Hybrid MoBiTM technology, the gel is monophasic, fully homogenous , smooth and easy to inject. The gel is then cut to different particle sizes, generating a line of differentiated products which are intended for diverse indications. The particle nature of the gel gives the ability to mold the injected material to the desired shape in the tissue and gives the product its firmness. Indicated for facial contours remodeling, volumizing and correction of deep facial wrinkles and folds such as nasolabial folds and Marionette Lines. Recommended needles are 25G or 27G thin-wall. Injection depth: subcutaneous, deep dermis. It is to be injected into the mid and deep dermis. Indicated for the correction of deep facial wrinkles and folds such as nasolabial folds and marionette lines. It is to be injected into the deep dermis. Injection depth: subcutaneous and deep dermis. Luminera is an R&D company, and a manufacturer of products in the aesthetic medicine field. The next-generation dermal filler for wrinkle filling, volume lifting, skin rejuvenation and face contouring. -and a new development /combined HA and calcium hysroxyapatite filler- HArmonyCa. Luminera Derm LTD, 1 Bat Sheva st., Lod, Israel.